Saskatchewan is a prairie province in Canada, with an area of 227,134.67 square miles (588,276.09 sq. km) and a population of around 1 million, mostly living in the southern half of the province. 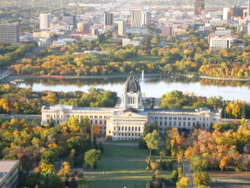 The province's largest city is Saskatoon, while the provincial capital is Regina. Other major cities, in order of size, are Prince Albert, Moose Jaw, Yorkton, Swift Current, and North Battleford. The province's name comes from the Saskatchewan River, whose name comes from its Cree designation: kisisk_ciwani-s_piy, meaning "swift flowing river." The 1874 "March West" of the federal government's new North-West Mounted Police (who later became the Royal Canadian Mounted Police) was crucial in the settlement of the area, and is believed by historians to have discouraged United States expansion into the area. The region that became Saskatchewan provided refuge to Sitting Bull and 5,000 Sioux who fled the United States army following the 1876 Battle of the Little Bighorn. The North-West Mounted Police provided protection and friendship and was able to maintain peace. From a great scale, Saskatchewan appears to be somewhat a quadrilateral. Because of its size, however, the 49th parallel boundary and the 60th northern border appear curved. Additionally, the eastern boundary of the province is partially crooked rather than following a line of longitude, as correction lines were devised by surveyors prior to the homestead program (1880–1928). 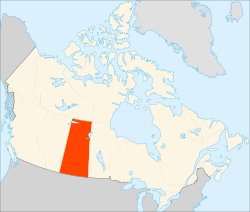 Saskatchewan is bounded on the west by Alberta, on the north by the Northwest Territories, on the east by Manitoba, and on the south by the U.S. states of Montana and North Dakota. Saskatchewan has the distinction of being the only Canadian province for which no borders correspond to physical geographic features. It is also one of only two provinces that are landlocked, the other being Alberta. Saskatchewan contains two major natural regions: the Canadian Shield in the north and the Interior Plains in the south. Northern Saskatchewan is mostly covered by boreal forest except for the Lake Athabasca Sand Dunes, the largest active sand dunes in the world north of 58°, adjacent to the southern shore of Lake Athabasca. Southern Saskatchewan contains another area with sand dunes known as the "Great Sand Hills" covering over 300 square kilometers (120 sq mi). The Cypress Hills, located in the southwestern corner of Saskatchewan and Killdeer Badlands (Grasslands National Park) are areas of the province that remained unglaciated during the last glaciation period. The province's highest point at 1,468 meters (4,816 ft) is located in the Cypress Hills. The lowest point is the shore of Lake Athabasca, at 213 meters (700 ft). The province has 14 major drainage basins made up of various rivers and watersheds draining into the Arctic Ocean, Hudson Bay, and Gulf of Mexico. Saskatchewan lies far from any significant body of water. This, combined with its northerly latitude, gives it a cold summer version of humid continental climate in the central and most of the eastern part, drying off to a semi-arid steppe climate in the southern and southwestern part of the province. The northern parts of Saskatchewan —from about La Ronge northward —have a subarctic climate. Summers can be very hot, with temperatures sometimes above 90°F (32°C) during the day, and humidity decreasing from northeast to southwest. Warm southern winds blow from the United States during much of July and August. While winters can be bitterly cold, with high temperatures not breaking 0°F (_17°C) for weeks at a time, warm chinook winds often blow from the west, bringing periods of mild weather. Annual precipitation averages 12–18 inches (30–45 cm) annually across the province, with the bulk of rain falling in June, July, and August. Prior to European settlement, Saskatchewan was populated by various indigenous peoples, including members of the Athabaskan, Algonquian, Atsina, Cree, Saulteaux, and Sioux tribes. The first European to enter Saskatchewan was Henry Kelsey in 1690, who traveled up the Saskatchewan River in hopes of trading for fur. The first permanent European settlement was a Hudson's Bay Company post at Cumberland House founded by Samuel Hearne in 1774. In the late 1850s and early 1860s, scientific expeditions led by John Palliser and Henry Youle Hind explored the prairie region of the province. In the 1870s, the government of Canada formed the Northwest Territories to administer the vast territory between British Columbia and Manitoba. The government also entered into a series of numbered treaties with the indigenous peoples, which serve as the basis of the relationship between First Nations, as they are called today, and the Crown. In 1885, post-Confederation Canada's first "naval battle" was fought in Saskatchewan, when a steamship engaged the Métis ("mixed," referring to natives who intermarried with Europeans) at Batoche in the North-West Rebellion. James Morrow Walsh of the North-West Mounted Police developed a strong friendship with Sitting Bull when his band of 5,000 Sioux moved into the region. A seminal event in the history of what was to become Western Canada was the 1874 "March West" of the federal government's new North-West Mounted Police. Despite poor equipment and lack of provisions, the men on the march persevered and established a federal presence in the new territory. Historians have argued that had this expedition been unsuccessful, an expansionist United States would have been sorely tempted to expand into the political vacuum. In any case, construction of the Canadian Pacific Railway would have been delayed or taken a different, more northerly route, stunting the early growth of towns like Brandon, Regina, Medicine Hat, and Calgary —had these existed at all. Failure to construct the railway might also have forced British Columbia to join the United States. Settlement of the province began to take off as the Canadian Pacific Railway was built in the early 1880s. The Canadian government divided up the land by the Dominion Land Survey and gave free land to any willing settlers. The North-West Mounted Police set up several posts and forts across Saskatchewan, including Fort Walsh in the Cypress Hills and Wood Mountain Post in south-central Saskatchewan near the U.S. border. The North-West Mounted Police's dedication to enforcing the law on behalf of the First Nations peoples impressed the latter enough to encourage good relations between they and the Crown. In the summer of 1876 following the Battle of the Little Bighorn, Sitting Bull, fleeing the U.S. Army, led several thousand of his Sioux to Wood Mountain in what is now southern Saskatchewan. James Morrow Walsh of the NWMP was charged with maintaining control in the large Sioux settlement. Walsh and Sitting Bull became good friends, and the peace at Wood Mountain was maintained. During this time, Walsh became famous in the American press as "Sitting Bull's Boss." In reality, Walsh was unable to fulfill his orders to convince Sitting Bull to return to the United States. 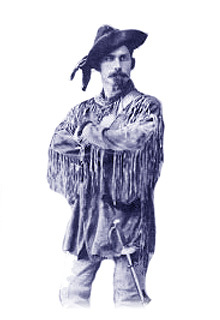 The Canadian government decided that Walsh's friendship with Sitting Bull was an obstacle to the Sioux's return to the United States, and in 1880 he was transferred to Fort Qu'Appelle, Saskatchewan. Many Métis people, who had not been signatories to any treaty, had moved into the region north of present-day Saskatoon following the Red River Resistance in Manitoba in 1870. In the early 1880s, the Canadian government refused to hear the Métis' grievances, which stemmed from land-use issues. Finally, in 1885, the Métis, led by Louis Riel, staged the North-West Rebellion and declared a provisional government. They were defeated by Canadian militia brought to the Canadian prairies by the new Canadian Pacific Railway. Riel surrendered and was convicted of treason. He was hanged on November 16, 1885. As more settlers came to the prairies on the railway, the population grew, and Saskatchewan became a province on September 1, 1905. The Homestead Act permitted settlers to acquire a quarter square mile of land to homestead and offered an additional quarter upon establishing a homestead. Immigration peaked in 1910, and despite the initial difficulties of frontier life, distance from towns, sod homes, and backbreaking labor, a prosperous agrarian society was established. In 1913, the Saskatchewan Stock Growers Association was established as the first ranchers' organization in the province, with three objectives: to watch over legislation; to forward the interests of the stock growers; and to suggest legislation to meet changing conditions. Its farming equivalent, the Saskatchewan Grain Growers Association, was the dominant political force in the province until the 1920s and had close ties with the governing Liberal Party. In 1970, the first annual Canadian Western Agribition was held in Regina. This farm industry trade show, with a heavy emphasis on livestock, is rated as one of the five top livestock shows in North America, along with those in Houston, Denver, Louisville, and Toronto. According to the 2006 Canadian census, the largest ethnic group in Saskatchewan is German (30.0 percent), followed by English (26.5 percent), Scottish (19.2 percent), Irish (15.3 percent), Ukrainian (13.6 percent), French (12.4 percent), First Nations (12.1 percent), Norwegian (7.2 percent), Polish (6.0 percent), Métis (4.4 percent), Dutch (3.7 percent), Russian (3.7 percent) and Swedish (3.5 percent), although 18.1 percent of all respondents also identified their ethnicity as "Canadian." First Nations ethnicities in the province include the Cree, Assiniboine, Saulteaux, Dene, and Dakota. Historically the Atsina and Blackfoot could also be found at various times. The largest religious denominations by number of adherents according to the 2001 census were the Roman Catholic Church with 286,815 (30 percent); the United Church of Canada with 187,450 (20 percent); and the Evangelical Lutheran Church in Canada with 78,520 (8 percent). Saskatchewan's economy is associated with agriculture; however, increasing diversification has meant that now agriculture, forestry, fishing, and hunting together make up only 6.8 percent of the province's Gross Domestic Product (GDP). Saskatchewan grows 45 percent of Canada's grain. Wheat is the most familiar crop and perhaps the one stereotypically associated with the province, but other grains like canola, flax, rye, oats, peas, lentils, canary seed, and barley are also produced. Beef cattle production in the province is only exceeded by that of Alberta. Mining is also a major industry in the province, with Saskatchewan being the world leader in potash and uranium exports. 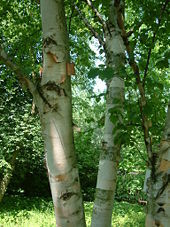 In the northern part of the province, forestry is significant. Oil and natural gas production is also a very important part of Saskatchewan's economy, although the oil industry is larger. Only Alberta exceeds the province in overall oil production. Natural gas is found almost entirely in the western part of Saskatchewan. Major Saskatchewan-based Crown corporations are Saskatchewan Government Insurance (SGI), SaskTel, SaskEnergy (the province's main supplier of natural gas), and SaskPower. Saskatchewan has the same form of government as the other Canadian provinces with a lieutenant-governor (who represents the monarchy in Saskatchewan), premier, and a unicameral legislature. For many years, Saskatchewan has been one of Canada's more progressive provinces, reflecting many of its citizens' feelings of alienation from the interests of large capital. In 1944 Tommy Douglas became premier of the first avowedly socialist regional government in North America. Most of his Members of the Legislative Assembly (MLAs) represented rural and small-town ridings. Under his Cooperative Commonwealth Federation government, Saskatchewan became the first province to have Medicare. In 1961, Douglas left provincial politics to become the first leader of the federal New Democratic Party. Provincial politics in Saskatchewan is dominated by the New Democrats and the Saskatchewan Party. Numerous smaller political parties also run candidates in provincial elections, including the Liberal Party, the Green Party, and the Progressive Conservative Party, but none is currently represented in the Legislative Assembly of Saskatchewan. After 16 years of New Democratic governments under premiers Roy Romanow and Lorne Calvert, the recent 2007 provincial election was won by the Saskatchewan Party under Brad Wall. Federally, the province has been a stronghold of the New Democratic Party, although recent elections have been dominated by the Conservative Party. Of the 14 federal constituencies in Saskatchewan, 12 were won by members of the Conservative Party of Canada in 2006, and 13 of 14 were won by Conservatives in 2004, while the federal New Democratic Party has been shut out of the province for two consecutive elections. Politically, the province is characterized by a dramatic urban-rural split —the federal and provincial New Democratic Party dominate in the cities, while the Saskatchewan Party and the federal Conservatives are stronger in the rural parts of the province. While both Saskatoon and Regina (Saskatchewan's largest cities) are roughly twice the population of an urban riding in Canada, both are split into multiple ridings that blend them with rural communities. Initially, there were only a few missionary or trading post schools established in Rupert's Land, later known as the Northwest Territories. The first 76 North West Territories school districts and the first Board of Education meeting formed in 1886. The pioneering boom formed ethnic bloc settlements. Communities were seeking education for their children similar to the schools of their homelands. Log cabins and dwellings were constructed for the assembly of the community, school, church, dances and meetings. Increasing prosperity helped provide funding to standardize education. Textbooks, normal schools for formally educated teachers, school curricula, and state-of-the-art schoolhouse architectural plans, provided continuity throughout the province. English as the school language helped provide economic stability because each community could communicate with one another and goods could be traded and sold in a common language. The number of one-room schoolhouse districts across Saskatchewan totaled approximately 5,000 at the height of the one-room school house educational system in the late 1940s. Following World War II, the transition from many one-room school houses to fewer and larger consolidated modern town and city schools occurred as a means of ensuring technical education. School buses, highways, and family vehicles created a population shift to larger towns and cities. Combines and tractors meant that the farmer could successfully manage more than a quarter section of land, so there was a shift from family farms and subsistence crops to cash crops grown on many sections of land. School vouchers have been newly proposed as a means of allowing competition between rural schools and making the operation of cooperative schools practicable in rural areas. Saskatchewan's medical health system is widely, though inaccurately, characterized as "socialized medicine": medical practitioners in Saskatchewan, as in other Canadian provinces, are not civil servants but remit their accounts to the publicly funded Saskatchewan Medical Care Insurance Plan rather than to patients. Unlike in Medicare in Australia or the National Health Services in the United Kingdom, which also have universal health care schemes, doctors are not permitted directly to supercharge patients over and above the statutory tariff for their services, and supplementary private health insurance is banned. There are numerous heritage and cultural attractions in the province of Saskatchewan. Museums, dinosaur digs, aboriginal cultural and heritage sites, art galleries, professional sport venues, spas, handcraft, antique and tea shops, agricultural tours, live theaters, and archaeological sites comprise over 600 varied Saskatchewan institutions. Saskatchewan is home to two prominent spas, ten provincial historical parks, and seven main national historical sites. Along with the Saskatchewan Western Development Museums, there are over 200 local pioneer heritage museums. Traveling exhibits help to supplement the permanent groupings of each institution. The Saskatchewan Museum of Natural History officially opened in Regina in 1955. 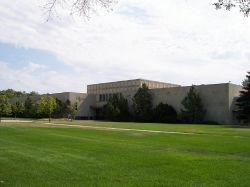 The MacKenzie Art Gallery in Regina is just one of a number of art museums and galleries. The Duck Lake Regional Interpretive Centre houses a collection of artifacts relating to First Nations, Métis, and pioneer history from 1870 to 1905, including information on the North-West Resistance of 1885. The Saskatchewan Roughriders are the province's only major professional sports franchise (Canadian Football League) and are extremely popular across Saskatchewan. The team's fans tend to congregate on game days throughout Canada, and collectively they are known as "Rider Nation." To honor Saskatchewan's centennial in 2005 the Royal Canadian Mint issued a commemorative five-dollar coin depicting Canada's wheat fields. Saskatoon, Saskatchewan's largest city, led the nation in GDP growth among Canadian cities in 2008 with a 5.4 percent increase according to the Conference Board of Canada metropolitan outlook report, released in January 2009. Regina, the capital city, had the second highest increase at 4.9 percent. In 2009, the Conference Board predicted, both cities will continue to see population increases and major economic activity. A report on international export sales showed Saskatchewan exports were up 63.8 percent in November 2008 over the previous year. Exports totaled $2.8 billion, up from $1.7 billion the previous November. The percentage increase was the highest in Canad—well ahead of the 3.3 percent average recorded nationally. Figures for manufacturing shipments for November 2008 showed an increase of 8.6 percent over the previous November, which was the second highest percentage increase in the nation. Nationally, manufacturing shipments dropped by 7.7 percent. Saskatchewan has the highest rate of growth in greenhouse gas emissions in Canada. The provincial government has initiated programs to help homeowners, schools, hospitals, and businesses "Go Green." Its goal is to reduce existing levels by 32 percent by 2020. The government is also engaged in a 16-year, $24.6-million project to reclaim 37 abandoned uranium mine and mill sites in northern Saskatchewan. ↑ Census Profile, 2011 Census - Saskatchewan. Statistics Canada (May 29, 2012). Retrieved June 18, 2012. ↑ Real gross domestic product, expenditure-based, by province and territory. Statistics Canada (November 8, 2011). Retrieved June 18, 2012. ↑ Saskatchewan, A Living Legacy. Hydrology Retrieved January 26, 2009. ↑ Statistics Canada. Ethnic origins, 2006 counts, for Canada, provinces and territories - 20% sample data Retrieved January 26, 2009. ↑ Statistics Canada. Selected Religions, for Canada, Provinces and Territories Retrieved January 26, 2009. ↑ Statistics Canada. Farms, by farm type and province (Census of Agriculture, 2001 and 2006) (Saskatchewan) Retrieved January 26, 2009. ↑ Saskatchewan Mining Association. General Information Retrieved January 26, 2009. ↑ Government of Saskatchewan. Oil and Gas Industry. Retrieved January 26, 2009. ↑ Statistics Canada. Gross domestic product, expenditure-based, by province and territory Retrieved January 26, 2009. ↑ Government of Saskatchewan. 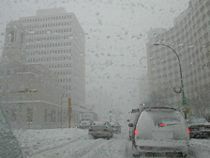 Positive Economic Indicators for Saskatchewan Retrieved January 21, 2009. ↑ Government of Saskatchewan. Go Green Retrieved January 23, 2009. ↑ Smart Science Solutions. Environmental Remediation Retrieved January 23, 2009. Natural Resources Canada. Provinces and Territories - The origins of their names Retrieved January 26, 2009. All links retrieved August 20, 2015. This page was last modified on 20 August 2015, at 19:12.